Copper nickel tees for the pipe fittings, pipe connections , used in the main pipeline to branch pipe. Copper nickel tees is a chemical pipe with three holes, that is, one import, two outlets; or two imports, one export, with T-shaped and Y-shaped. Types: equal tee or unequal tee. If the end user require third party inspection , it is available.Lots of third party inspection organization have inspected our products , Such BV,SGS,ABS etc. 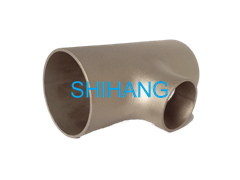 Shihang exported copper nickel pipes, flanges, fittings for 10 years and no any complaint from the end user. We have own testing laboratory and strong ability of QC. Each order , our mill test certificate as per EN 10204 3.1 will be issued with the products. Confirm our products are totally meet with your requirements.